AN elaborate scheme by a truck driver to sell a load of deodorant and other personal hygiene materials he was transporting for a well known distribution company in Windhoek backfired and landed him behind bars. A large amount of cash discovered in the cab of the truck uncovered the elaborate ruse to commit theft and blaming it on people unknown. Deputy Commissioner Eric Clay, Hardap Regional Crime Investigations Coordinator, said he was made aware of the matter but that investigations into the case are still at a very early stage. Motorists stopped at the truck to assist the driver that seemingly left the road after one of its front tyres burst. 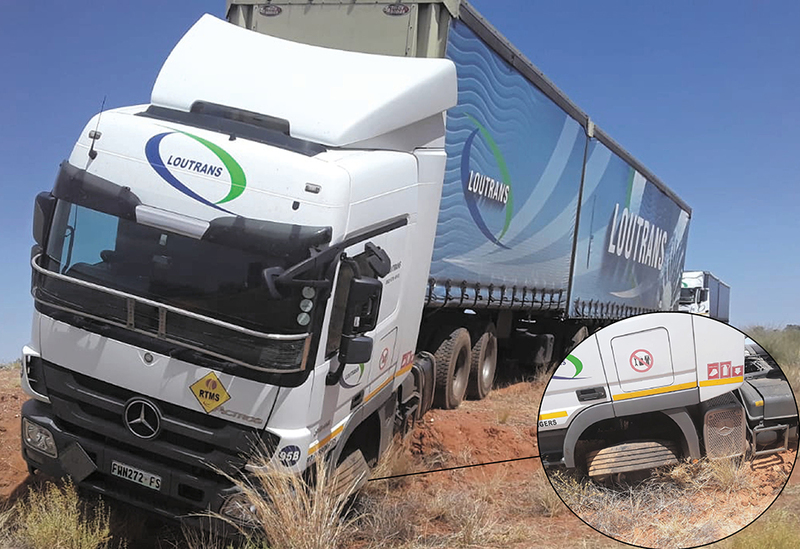 The driver claimed the truck left the road and that in the process he bumped his chest hard on the steering wheel and that he was in need of medical assistance. Thousands of dollars worth of damage was caused to the truck in the process. An ambulance was dispatched to the scene of the accident and the driver was taken to a hospital in Rehoboth. After receiving treatment, the driver was taken back to the scene where his truck was partially blocking the road to help change the tyre and to remove the vehicle. Upon arriving at the scene to investigate the cause of the accident, police officers discovered a bag filled with cash. The South African driver could not explain why he had such a large amount of Namibian currency in his possession and upon further inspection, officers found that scores of pallets have been removed from the heavy truck’s trailer. The driver could not explain the disappearance of his load and told officers that the load must have been stolen while he was at the hospital in Rehoboth. The driver was arrested when he eventually told police officers that he offloaded the pallets of retail goods at the railway station of Gibeon and that another person gave him the large amount of cash in return. 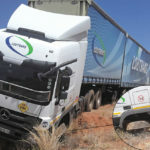 The truck belonging to Loutrans sustained thousands of dollars worth of damages during the accident that the drivers staged to hide the fact the he sold the load he was carrying to a yet unknown person in Gibeon.